Once upon a time there was girl who enjoyed reading. And she enjoyed telling other people about these books as well. This girl likes stories about friendship. And while she is not a dog person, she found a must have for dog lovers in a book about two doggie friends named Olive and Pekoe. 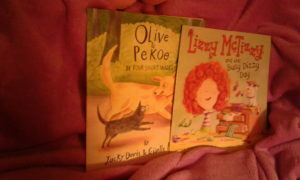 Olive & Pekoe: In Four Short Walks by Jacky Davis, is a story that is broken up into four different walks. Each of these walks highlights how different these friends are, but also how perfect opposite friends can be. These best of buddies, in Giselle Potter’s illustrations, find squirrels, take rests in the shade, play at the dog park, stand up to bullies and so much more. Each of these chapters make for a great read-aloud story where you have a natural stopping place. Perhaps best for anytime story-time and not bed time, especially if your pup is a rambunctious one. And another book this girl found about busy beings, but in this case a book about busy kids is Sarah Weeks, Lizzy McTizzy and the Busy Dizzy Day. Rhyming text helps move story along with the funny antics of Lizzy as she tries to find her missing shoe. She hunts high and low and finds all sorts of fantastic goodies, but she cannot find her shoe. The party is starting soon, and Lizzy does not know what she will do without that shoe! Yet, in Lizzy fashion, she comes up with a rather unique solution. With the cute art of Lee Wildish we learn that Lizzy is not your “normal” kind of kid, therefore, you know her solution will not be a traditional solution either. The colors are bright and detailed and compliment the text perfectly. And of course, these girl wants to tell you about a book about a different type of busy. 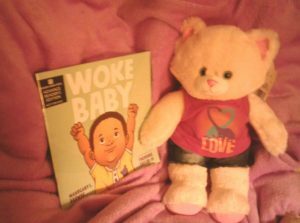 This time we see how being Woke is a form of busy in Woke Baby by Theodore Taylor III with some pretty far-out and busy art by Mahogany L. Browne. First, this girl learned what “woke” means in a new context. She knew “woke” meant “I am awake. I have woken up.” But in a more metaphysical manner, it means becoming aware of things around them. And this my friends, is one Woke baby in both meanings. This baby is awake and aware of the things, people and events around them. This baby sees things that are good and bad. But most importantly this baby is wide awake and ready to go. Until it is time to go to rest (but not sleep) and start all over again. Once upon a time there was girl who read three books she wanted to tell others about. That girl was me.